Our organization is engaged in manufacturing, supplying and exporting premium quality Formed Stainless Steel Grid. It is mainly used in electrical circuits as spacer between grid elements. Galvanized washers will be used as spacer between grid element and the same is insulated from grids by using mica washers. Panel is made from number of AISI - 304/AISI - 410 steel hammered in zig-zag shape, connected by arc welding. 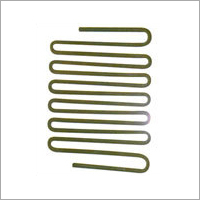 It is temperature coefficient of resistance is 0.15% / c for AISI-410 & 0.094%/ c for AISI-304. Offered resistors are known for their enhanced security, low maintenance, easy installation and seamless finish. Formed Stainless Steel Grid are also known as rod grids. The expertise offers these grids with high durability which is being appreciated by our clients globally.